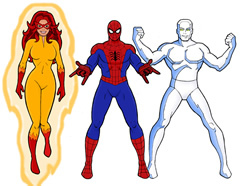 The web-slinging Spider-Man (Dan Gilvezan) is joined in his animated adventures by Iceman (Frank Welker) and Firestar (Kathy Garver). Peter Parker, Bobby Drake, and Angelica Jones are all college students at Empire State University. The three work together as their heroic alter-egos to defeat the villainous Beetle and decide to form a team as the “Spider-Friends.” They live together in the home of Peter’s Aunt May (June Foray) with her pet dog named Ms. Lion (Frank Welker). Together, the superheroes battle various super-villains like Dr. Octopus (Michael Bell), Kingpin (Walker Edmiston), Green Goblin (Dennis Marks), and Juggernaut (William H. Marshall). Spider-Man: Lots of Crimefighting Action on Spidey DVDs!